Conflicts and disagreements are natural aspects of our lives. They can occur whenever two or more people interact. Because people have their own feeling and perceptions on issues, conflict naturally occurs when contradictory viewpoints meet. Not all varying perspectives involve significant conflict where there is a need for intervention or involvement by another party to help reach a mutual agreement. However, there are times when two of more individuals have opposing perspectives where they themselves can not come to a mutual or satisfactory agreement, and conflict resolution is necessary. 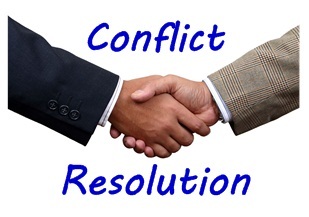 We provide the knowledge and skills necessary to resolve conflict in a positive way. We offer strategies on how to facilitate the amicable ending to a conflict by actively listening and then communicating information about conflicting motives or perspectives in order to reach an optimal outcome. We also offer strategies on how to assess conflict situations to determine the best facilitation method as well as techniques on how to approach conflict. This series provides the skills and tools needed to resolve disagreements while building rapport, repairing trust and building better relationships. We also provide a wide range of approaches, strategies, and techniques to understand and manage conflict at all levels including communication techniques that assist with conflict resolution and tips on how to minimize defensiveness and hostility.